Château de la Touche-Trébry was built at the end of the 16th century by Christophe de la Roche, a royal knight and member of the nobility of the diocese of Saint-Brieuc. The fireplace in the drawing room bears the date of 1579. However, it is located in a part of the castle where a roof window on the northern side displays a much older style than the rest of the château. As the de la Roche family was a long-established family in Trébry, it can almost certainly be assumed that the château which we see today is the result of the extension to the earlier estate, of which only a small part has remained unchanged. Christophe’s son, Jérome de la Roche, Governor of Moncontour and Jeanne d’Avaugour’s husband, had a son, Jean, who was killed by a baron from St. Brieuc in 1610, probably in a duel. His sister Elye, who married Julien Freslon, Marquis of Freslonnière, from near Rennes in 1608, therefore inherited the entire, extensive estate of her parents. Julien Freslon was the victim of an assassination attempt in 1623, which was carried out by a 24-year-old nobleman from Trébry, Julien de Carmené, squire and owner of “la Ville-Amaury”. He shot at his opponent with a crossbow as he left the church, without however hitting him, doubtlessly because of an argument during the service regarding rank. Instead, he seriously injured one of his servants with a sword. The perpetrator was sentenced to “serve the King on the galleys for life” by an order of 19th July 1623. No doubt sickened by this incident and also because he probably favoured the vicinity of Rennes over the charm of Méné, it appears that Julien Freslon left the region very quickly, maybe even immediately after the death of his wife in 1628. In any event, it is clear that the castle was rarely occupied around the middle of the 17th century. An inventory drawn up by Alexis Freslon, Marquis of Acigné, on 16th March 1726 showed the considerable importance of the estate and the territorial rights attached to it: high, medium and low dispensation of justice, supreme powers, markets, feudal goods, mills, lakes, fish ponds, fisheries, dovecotes, game enclosures, right up to a gallows on a heath near Bois Aubé. Even those parts of the château that have meanwhile been lost can still be identified: two towers, a bakery, a dovecote, the tower clock, drawbridges and part of the moats. The most important parts of the château, however, have survived to the present day. The estate came into the possession of the Talhouet-Bonamour family through marriage in 1748 and part of it devolved upon Count Joseph de Talhouet on 28th September 1794 (old French: 28 Fructidor An II). The castle itself was not occupied for a long time; it was robbed of its furniture and merely served as a granary for neighbouring farmers. It was sold to the Burgher Francois Quéro-Brangolo of Loudéac on 22nd May 1803. He possessed a considerable fortune and, in particular, had founded a company together with his fellow citizens Louis Carré, François Delaize and Louis Quérangal to run the ironworks of Vaublanc and Harduinaye in order to safeguard the armament of the French Army. François Quéro-Brangolo died in 1819 and left behind two married daughters – the Mistresses Glais and Fravel – and numerous grandchildren. Unfortunately, at that time it was decided to divide the castle into two parts on the basis that maintaining it as a single inheritance would be too costly and that the living quarters were not large enough and were in poor condition; moreover, it also served as a corn garner for the leased agricultural estate. The main staircase and the well were jointly used, whilst some rooms were utilized as through passageways. Keys had to be handed over to the adjacent proprietor in order to go through certain doors, etc This situation could only lead to an alarming deterioration in the structural condition of an already severely dilapidated building as well as to numerous incidents. 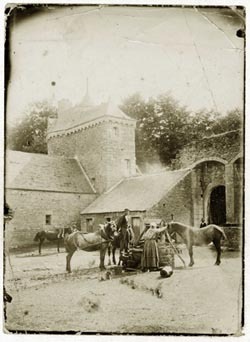 In 1878, Esther Fraval, wife of Count Louis de Calan, pushed through a restoration of the castle by court order, the costs of which were also borne by Rear Admiral Grivel and his wife, who in 1859 had acquired the part of the castle which had fallen to the family Glais. 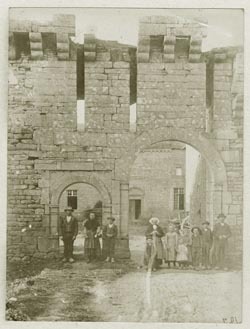 Count and Countess Louis de Calan eventually became proprietors of the entire château in 1880 and were able to set their sights on the restoration of Touche-Trébry. The most important construction work was completed before the outbreak of the First World War but the interior decoration had not been started. Some of the architect's blunders are undoubtedly regrettable, such as the metal beams, the raising of the ceilings on the first floor, which altered the proportions of the rooms, and the inadequate thickness of the parapet and ramparts, slates, etc. However, the fact that the castle was by and large restored in incredibly exact detail with regard to the original outer structure deserves praise and recognition. 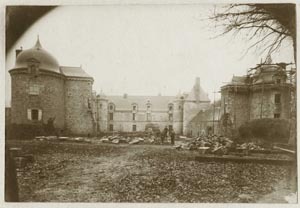 Restoration of the interior of the castle was not tackled until 1925 by Count Pierre de Calan – nephew of the aforementioned – and has been continued by his son ever since. Unoccupied for a long time, robbed of its furniture and used as a farm probably even before the Revolution, Château de la Touche-Trébry has virtually no history. Above all, it was not touched by the events surrounding the Chouannerie (French Revolution). The wrought-iron well, which originated from the Boishardy estate in Bréhand, was not acquired until around 1930. Although the château was built in the same way as the residences of the landed gentry that were constructed during the Hundred Years’ War and the Religious Wars, it never had to withstand an attack. This is fortunate as neither its walls, which were not very thick, nor its large windows would have provided much military security. Strongly influenced by the Italian Renaissance, the building can almost be classified as being in the style of Louis XIII. Built as a unified whole, without alteration or extension for many years, it appears as a homogenous ensemble; true to the original and harmonious, it is still happily occupied today.